I was planning on doing this with my clicker as well (brand: einstruction). It runs a Motorola cpu with a separate RF chip and firmware is on a eeprom. It also has 6 test pins labelled PROG in the battery compartment. @atrain: i got an older einstruction (the orange-blue one). it has a nordic nrf24e1 in the clicker and a nrf24e1 plus a pic18 in the base. So after a good number of correct answers are received you make a transceiver auto-answer for you. You first need to record your own transmitter ID by pressing a special combination and then just fake pressing a button for each question. Somehow this feels like cheating. maybe because it is cheating…. No, it really is cheating. Sometimes, “Working the system” IS cheating. Beyond all of the comments so far. I am surprised Turning Point hasn’t created secure encryption software in preparation for this type of hacking. (I am betting the OEM engineers thought of it but didn’t press the issue because of time to market and cost constraints.) Really, this type of hacking can make or break a company. I’m jumping over a lot of discussion. But in the end, I think pushing companies to do their best or bust is a good thing. Dry, I know, but this sort of stuff props up the notion hackers do think from time to time. This is exactly the kind of tinkering I’ve thought of with the i>clicker system. I wouldn’t use it for evil, but rather for meddling (spoof everyone’s vote when it is a participation question so everyone gets it wrong and watch the instructor freak). Something I’d like to do once I get a bit further into my EE/CpE degrees. To answer the question about why secure encryption hasn’t been added to these clicker systems, it’s mostly that A) these companies don’t typically feel student users would be smart enough to hack them and B)the typical user would only have his/her hands on one for less than an hour unless it was snuck out of classroom without permission. Given the expense of these systems and the cost of replacing even one clicker, I’m surprised anybody with legitimate access to one actually decided to tear one down (let alone the numbers I’ve read about here). Mostly, the only way for an average hacker to get these clickers is by theft or “borrowing” from a classroom’s set. From a teacher’s point of view, while I’m happy to see some students thinking, hacking and doing the math and programming needed for this project, I sure hate the idea of instructional funding possibly being abused since it’s so hard to come by. 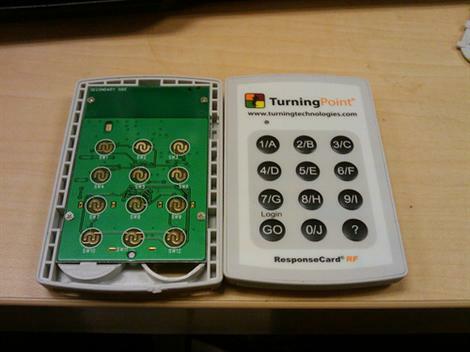 @Tod: They may loan these clickers out to students at some institutions, but at MTU they have students buy their own. They also aren’t that expensive…only about $30 for one. it would be great to have an open source clicker system (i-clicker claims to be, but i have never seen any source code). it would also be useful for class room use: with a free protocol at the base station, clickers could be used for anything one could script! group the clickers and show group progress, have different students answer different assignments, sign up for different assignments using clickers..
@Tod: You are required to purchase these at the institution I work for. How could they be loaned out in class when each clickers id is assigned to an individual person for grading purposes? The idea that there is no encryption because the manufacturers assume that students are not intelligent enough to hack it seems pretty absurd to me. Someone dropped the ball on this. I believe because the Intel patents have run out on the design – so no royalties. It’s 2nd sourced by everyone – which is way important – especially these days when no one stocks parts. Also, I can’t believe, with the dozens of variations, you can’t find one with secure programming memory. Does anyone know what the output of the clickers is? I mean, I’d love to design software for the simplest einstruction clickers but what is the output for each clicker and each answer that the computer actually sees? Anyone??? ?